Most visitors to North India flock to Agra to see the Taj Mahal, never realizing that there’s more to see beyond the monuments. 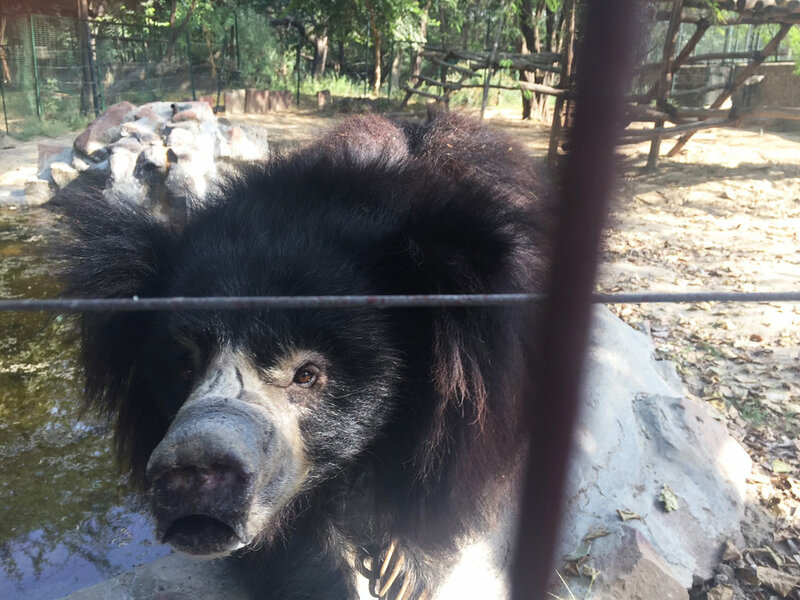 Just outside the city are two amazing animal rescue centers that provide care and a safe home to Asian elephants and Indian sloth bears. 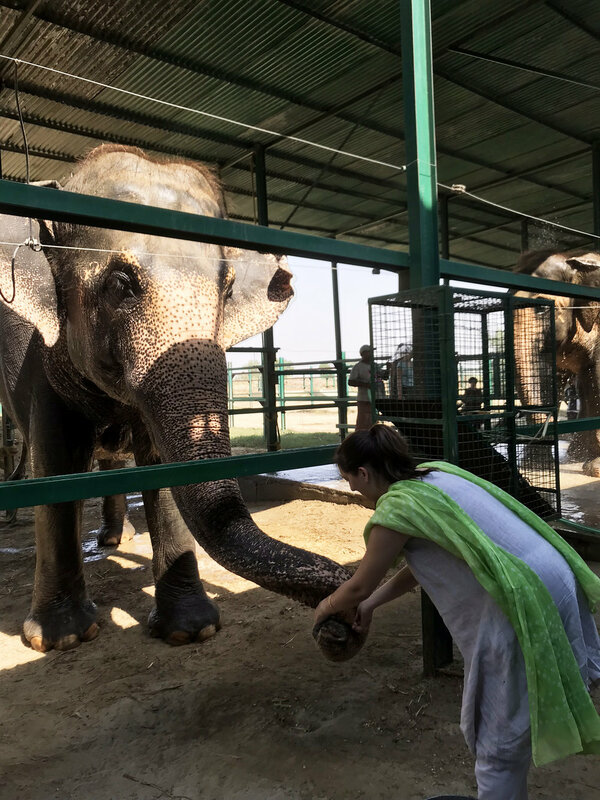 I made a long-awaited trip last week to meet these animals and the people of Wildlife SOS - one of the most impressive wildlife conservation non-profits working in India. Meet my beautiful new friend PHOOLKALI. Her name means "Beautiful Flower" in Hindi. She has a sweet tooth and loves holding things in her trunk when she goes for walks. 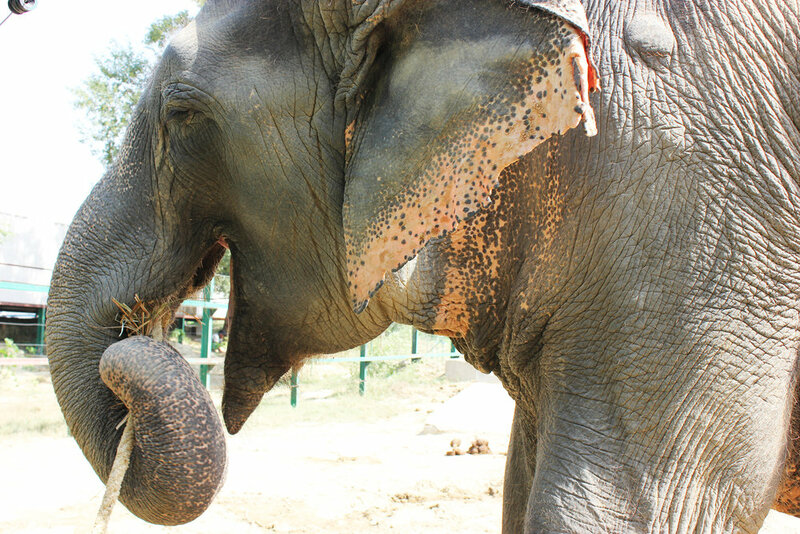 She was rescued from being a begging elephant for nearly 50 years. ("Begging elephants" are used by their mahouts, or handlers, to make money by forcing the elephants to perform tricks for people’s entertainment. 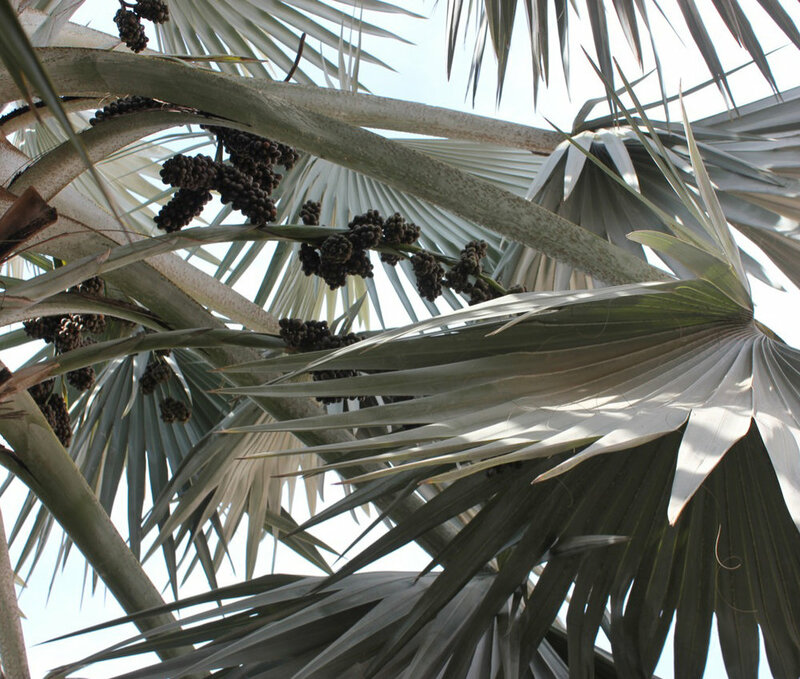 Mahouts also sell fruit so people can feed them by hand.) Phoolkali was found partially blind from neglected care, and she had trouble walking after years of pounding tarmac roads. When she was rescued she had never known kindness from humans, but she is now adjusting well. Her feet have healed from being on natural ground, and she has become close friends with other elephants at the center. This beauty is ASHA. Her name means "Hope" in Hindi. She loves sugarcane and lounging around in the water pools. She was used to give rides to tourists up the steep slope of Amber Fort in Jaipur, and the constant weight of the iron bed plus the riders on her back put immense strain on her joints which led to a terrible leg injury. 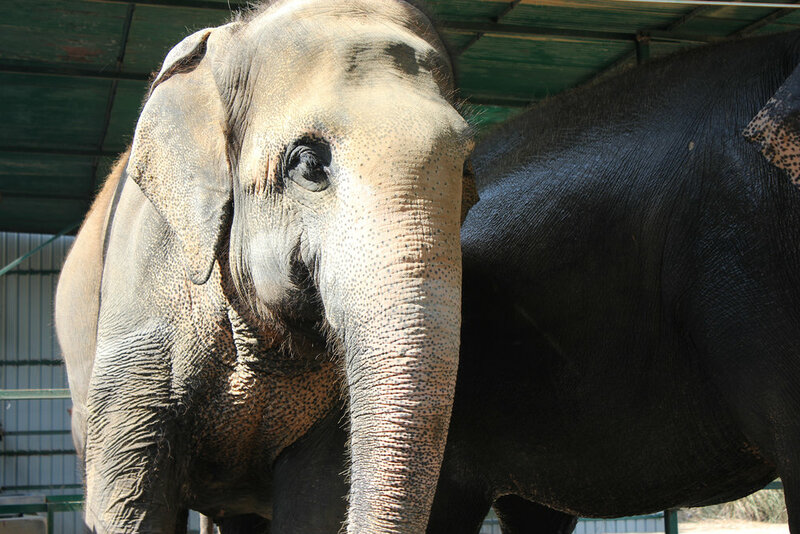 When she couldn’t walk up the incline to the Fort she was sold to be a begging elephant in Indore, with her injuries never being properly treated. Luckily Asha was rescued by Wildlife SOS in 2015 and is now doing well and living in peace, released from her previous 46 years of enslavement. These are just two of the rescued elephants I met -- and scrubbed! -- at Wildlife SOS’s Elephant Care and Conservation Center. 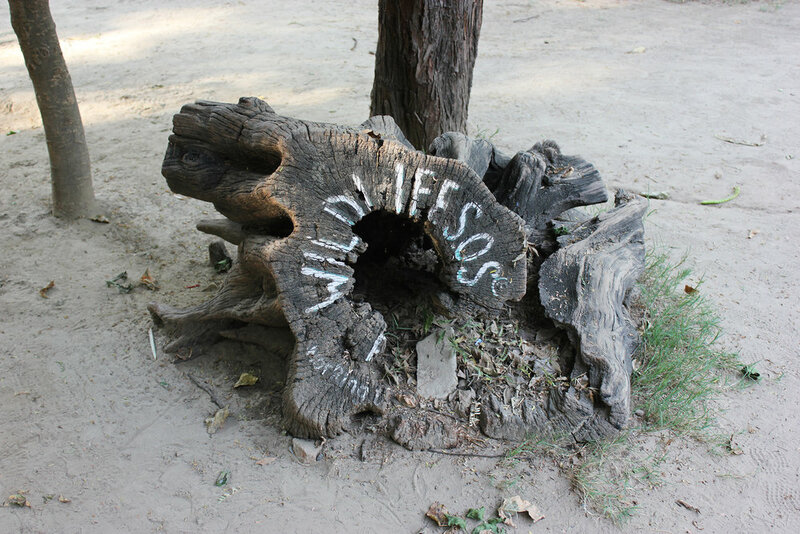 Founded in 1995, Wildlife SOS works in many areas: protecting Indian wildlife (including elephants, leopards, bears, reptiles and others), conserving habitat, studying biodiversity, conducting research, and creating sustainable livelihoods for communities that would otherwise depend on wildlife and poaching for sustenance. I learned about Wildlife SOS’s work about 6 years ago, and it has opened my eyes. I am a huge animal lover, and have been passionate about wildlife conservation since I was in 7th grade. Throughout my life I have been aware of the issues around endangered species, extinction, habitat loss, etc. I've worked with scientists on sea turtle research in Mexico, I was a veterinary technician, and I often support and donate to conservation causes. Despite all of this I wasn’t aware of the reality of many of India’s captive elephants. When I was young I was in India all the time with my family. We would stay for months on end with my grandparents in Delhi, and would travel around visiting other relatives in cities like Agra and Mumbai. We would often visit the historic monuments where it was commonplace to see people offering camel and elephant rides. You’d even see this on the beaches and at hotels. We all loved animals so my sister, brother, and I enjoyed these rides off and on and loved being able to get close to these big mammals. I remember also seeing snake charmers, monkeys dressed in kids clothing, and even vaguely remember “dancing” bears. As a young child I was always excited to see an animal, but I really didn’t know what was happening in front of me. As I grew up I became disgusted at seeing animals dressed up and being made to perform and I wished circuses didn’t exist, but even then I had no idea that an elephant ride was in the same category. Neither did my animal-loving parents who grew up in India. I’m sad to say that as recently as 7 years ago I rode an elephant with my then-fiancé at Amber Fort in Jaipur. It was his first trip to India, and he had never seen an elephant up close so it seemed like a wonderful thing for us to do together. I had mistakenly assumed that these elephants giving rides to tourists at Amber Fort -- a UNESCO World Heritage Site no less -- were well taken care of by their mahouts. I had even been told as much years ago by some people at the Fort who said the elephants only work a few hours in the morning and then rest. I believed them and it made sense considering elephants are associated with Ganesha, the Hindu God, and are widely worshipped. But shortly after that trip I learned about Wildlife SOS and the truth about India’s captive elephants. The reality is that Asian elephants have been exploited for thousands of years, and for a wild elephant to obey the orders of a human, in most cases it means that its spirit has to be broken. A Wildlife SOS documentary showed that in India wild baby elephants are stolen from their mothers and sold illegally to become captive elephants. They are then confined to a small space like a ditch or hole in the ground. Each leg is shackled independently and pulled in four directions. They are left for up to 30 days with no food or water. This either kills or breaks them. Elephant calves that survive then go on to live a life of misery and abuse at the end of a chain. Most of the elephants in captivity work for 12-14 hours a day with no rest, not enough food or water, are beaten with instruments called bullhooks, rarely bathed, and suffer great psychological stress, sickness and disease. A healthy elephant needs lots of room to stay active and freely roam on natural surfaces, not hot roads that injure their sensitive feet and destroy their nails. They need protection from the sun with shade or mud because their skin is quite delicate and prone to sunburn, just like us. They need lots of fresh food and water, and to be close to other elephants as their social structure is so important. Basically, elephants need to live in the wild with their own kind. But for now we are lucky that organizations like Wildlife SOS exist. So far they have rescued 26 sick and injured elephants, changing their lives immeasurably for the better. Wildlife SOS plans to expand their facilities and will rescue as many elephants as possible, with the long term goal of ending trafficking of wild elephants to be used as captives. They have also been working to help elephant owners who have expressed the desire for an alternative livelihood, especially with the recently enacted ban on captive elephant trading by the Indian government. 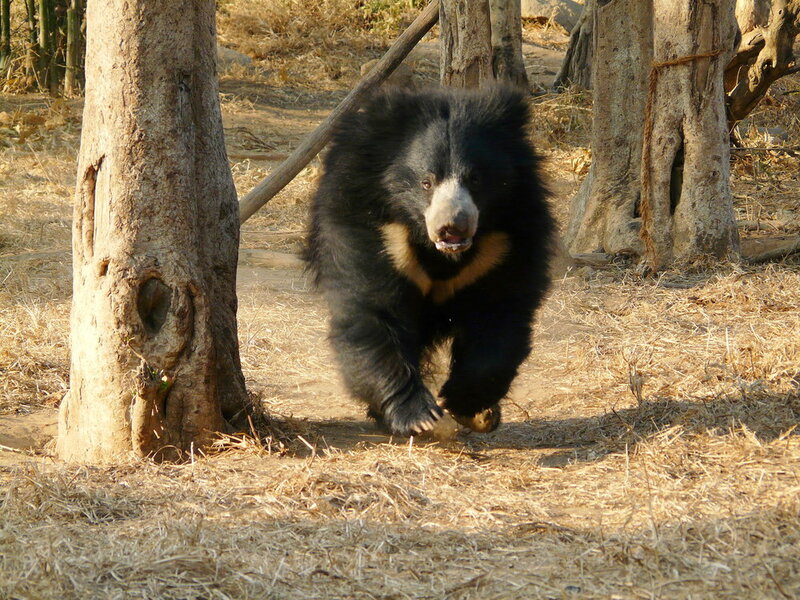 Wildlife SOS also has the Agra Bear Rescue Facility that is home to over 200 Indian Sloth bears. The real "Baloo" of Kipling's The Jungle Book, these bears have a shaggy black coat, long muzzle, and a white V-shaped patch on the chest. They love to “vacuum” up termites with their long snout. While sloth bears are vulnerable in the wild due to many factors, they are thankfully no longer being poached to "dance" due to Wildlife SOS's efforts. Over 400 years ago a nomadic tribe known as the Kalandars began making sloth bears “dance” as entertainment for Mughal Emperors. This continued over centuries, eventually leading to modern entertainment for tourists. Sloth bears are powerful, wild creatures. Mothers are devoted protectors of their young. So poachers would first kill the mothers and sell off the orphaned cubs to the Kalandars. The next step was to force a red hot poker into the muzzle to create a crude piercing. A coarse rope would then be permanently strung through the piercing to make the bears into live puppets. A tug on the rope caused intense pain and would make the bears jump on demand, or “dance”. These poor bears lived their entire lives in agony and at the end of a 4-foot rope. It’s hard to imagine this level of cruelty but for the Kalandars the dancing bear trade had become their only means of survival, and it was what one generation taught the next. Many of them did not know what they were doing was wrong or illegal. Here’s the GREAT news: Through the efforts of Wildlife SOS the dancing bear practice has been eradicated. In 1996 there were 1,200 dancing bears throughout India; today there are ZERO, with the last dancing bear rescued in 2009. 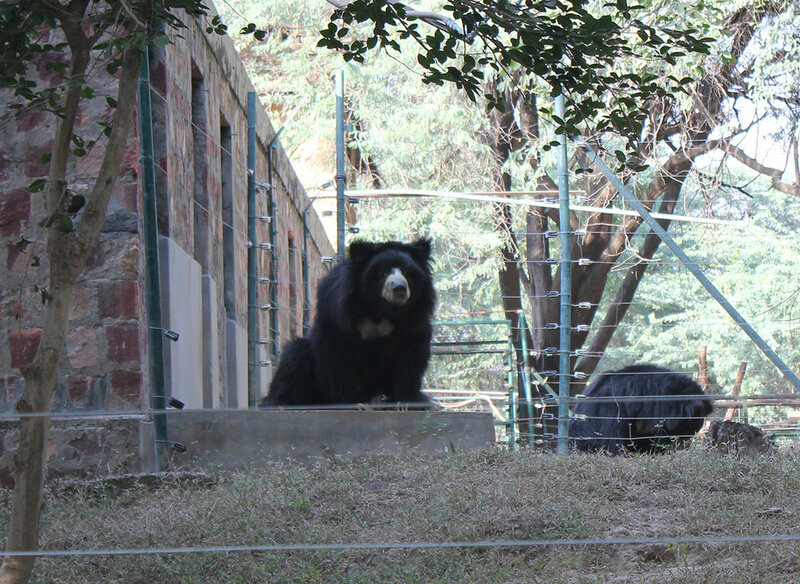 Wildlife SOS has rescued and rehabilitated over 620 bears and they are now living peacefully in their sanctuaries. They succeeded in rescuing the bears because they supported the Kalandar community, gained their trust over many years, and helped them achieve alternate livelihoods, education and training. Three thousand Kalandar families across India willingly relinquished the bears in exchange for the support, and signed contracts never to harm wildlife again. Wildlife SOS is fully funding the schooling of their children as well, with girls making up more than 50% of the students. Wildlife SOS's efforts to end the abuse of the sloth bears and support the Kalandars have been a remarkable success. Below are some photos of the bears I met! For the bears' safety and your own, you are separated from them by fences. Only the handlers that the bears trust are allowed inside with them. Some of the bears have been so traumatized by humans that they shy away at the sound of human voices or start to sway in stereotypic behavior, which is painful to witness. Many are blind from the abuse they received as cubs. But they now live in a beautiful sanctuary, and their terrible past is behind them. Here they can play, laze about in the forest and peacefully sleep, and eat all the freshly made organic porridge and honey they want. I strongly encourage anyone that visits the Agra region to visit these centers. You will have the chance to touch, feed, bathe and walk with the elephants, observe many sloth bears, meet wonderful people, and learn an incredible amount. Even better, you can volunteer to work at both of these centers for a week or more, which is what I’m planning to do on my next trip back to India. If you volunteer at the Wildlife SOS Rescue Facilities, you'll make a significant contribution to the welfare of bears and elephants in India, and the personal contentment will be yours forever. I was so inspired by my visit to Wildlife SOS that I've decided to support their work once we launch our first ECOLOGIES collection next year. Stay tuned for that, and in the meantime you can learn more more about volunteering, sponsoring an animal, or donating at wildlifesos.org. This is Hari Singh, Education Officer at Wildlife SOS, showing us the torturous bullhooks and chains used on the elephants prior to being rescued. Hari left an aeronautical engineering career to come to Wildlife SOS and work with the elephants. He told me that the personal satisfaction that he gets from his work with Wildlife SOS far surpasses what he was doing before. 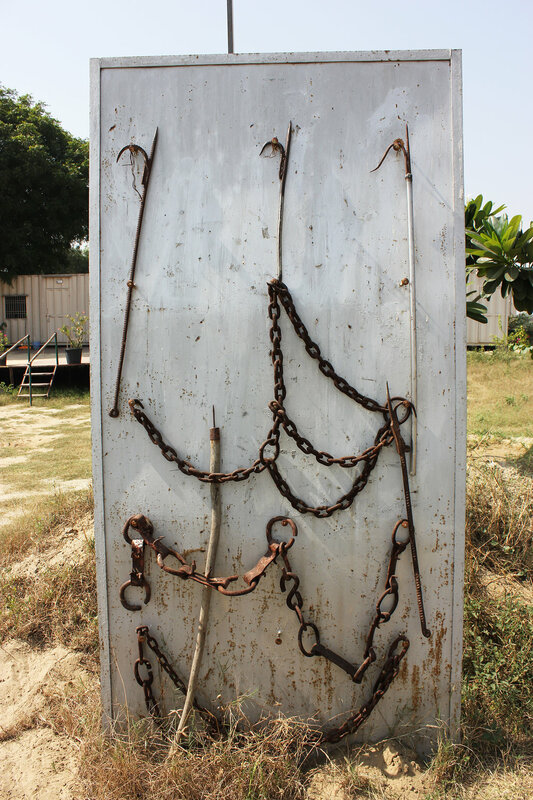 Close-up of the bullhooks and chains. One of Wildlife SOS's dedicated veterinarians. He showed us the bear hospital facility with all its state of the art equipment and machines. Along with treating all ailments and injuries, these doctors give the bears yearly physical exams and each bear has its own electronic medical record! So impressive. In the bear kitchen. Organic and nutritious porridge made fresh for the bears every day. With honey! They certainly deserve it. 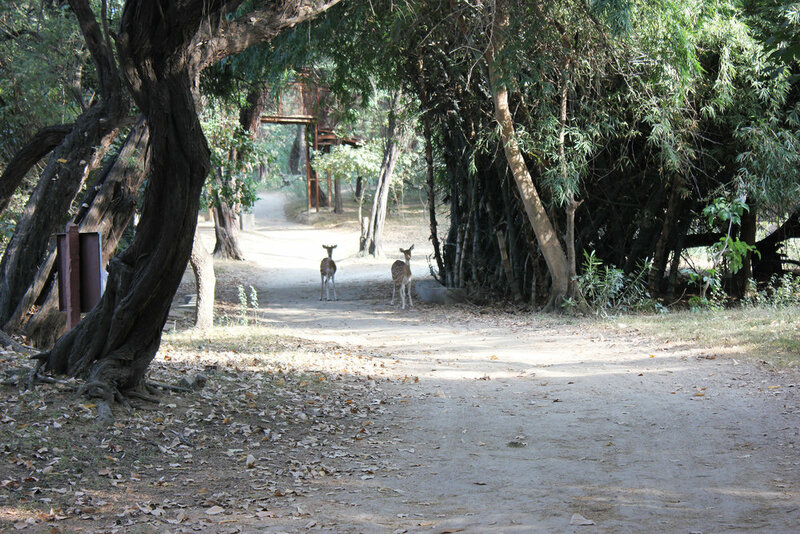 Spotted deer in the forest of the Sloth Bear Sanctuary.